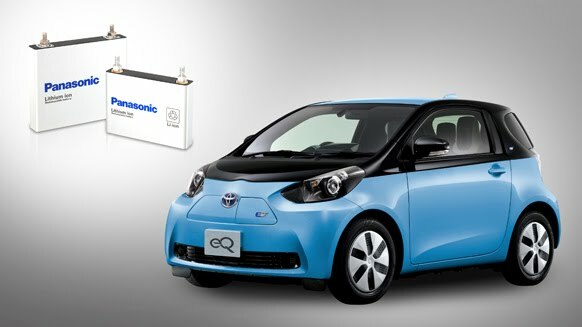 Panasonic have announced that they will supply lithium-ion batteries for Toyota Motor Corporation's eQ electric car. Panasonic is building up its battery business to meet increased demand. The company is already supplying nickel-metal hydride (Ni-MH) batteries for hybrid electric vehicles to a growing number of automotive manufactuers around the world, as well as lithium-ion batteries for hybrids, plug-in hybrids and electric vehicles. Panasonic has already supplied lithium-ion batteries to Toyota’s Prius Plug-in Hybrid and Prius α hybrid. The supply agreement with Toyota now expands to an all-electric vehicle model as well as hybrid and plug-in hybrid models. Toyota announced it will offer an electric compact called eQ, based on its iQ model, in Japan and the US in December though the number of the vehicles made will be extremely limited - about 100.